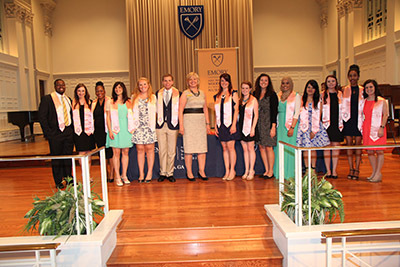 School of Nursing award winners pose with Dean Linda McCauley at Saturday's awards and pinning ceremony. In honor of 2014 Commencement, the School of Nursing is proud to recognize its 2014 student award winners. Awards were presented during a special ceremony on Saturday, May 10 at Glenn Memorial United Methodist Church. This award is given to a BSN and MSN student who exemplify the school's values of scholarship, leadership, and social responsibility through their nursing practice. This award is given to BSN students who demonstrate excellence in academic achievement and service as baccalaureate students. This award is given to an ABSN student who demonstrate excellence in academic achievement and service as a baccalaureate student. This award is given to an MSN student who demonstrate excellence in academic achievement and service as a graduate student. This award is given to a graduating student from the PhD in Nursing program who has demonstrated remarkable excellence in academic achievement, scholarship, teaching, and service throughout the PhD program. This award is given to a graduating student who exemplifies the compassion and caring spirit of the school's namesake, Nell Hodgson Woodruff, and who have demonstrated compassion and caring as a nurse. This award is given to a BSN student who has engaged in exemplary scholarly activities with faculty and a faculty member who has collaborated with a BSN student to advance nursing scholarship. This award is given to an MSN student who has engaged in exemplary scholarly activities with faculty and a faculty member who has collaborated with an MSN student to advance nursing scholarship. This award is given to a nursing student who has demonstrated the ability to shape health policy and legislation. This award was initiated in 1949 by the Associates of the Nell Hodgson Woodruff School of Nursing to honor an outstanding graduating BSN student. The award is presented by the Nurse's Alumni Association to a student who exemplifies an outstanding academic record, excellence in clinical practice, a true passion for the art and science of nursing, and a commitment to the school and the nursing profession. This award was initiated in 1949 by the Associates of the Nell Hodgson Woodruff School of Nursing to honor an outstanding graduating MSN student. The award is presented by the Nurse's Alumni Association to a student who exemplifies an outstanding academic record, excellence in clinical practice, a true passion for the art and science of nursing, and a commitment to the school and the nursing profession.